Former resident of Savannah, Georgia, presently residing in Southern California. Tony Dorty at Tuskegee University November, 2000 wearing the uniform of a First Sergeant in the 1st Regiment South Carolina Volunteers A.D.
Bernard Siler and Tony Dorty, Reenactors, at Port Hudson, Louisiana. while four millions of our brothers and sisters shall march out into liberty." those First Colored Volunteers began to fade, like the sun beneath the horizon. Perhaps lost in the exploits and dust stirred up by those who followed. first page. Not a large volume only 127 pages still not one single page is wasted. curriculums of middle and high schools. 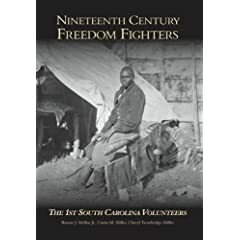 volume, "Nineteenth Century Freedom Fighters, The 1st South Carolina Volunteers". Black Race in that conflict is incomplete if this volume is missing from that study.